Every now and then, something comes along that organizes a lot of seemingly independent ideas and questions I've had for years into one tangible bloc of sense. It's always an "aha!" moment––and sometimes a "why didn't I think to put it that way all at once myself?"moment. Tonight, one of those things came along. Growing up in northern Pennsylvania and then going to college in south-east Tennessee, you can imagine I became very familiar with the whole north-south divide. I think I was at school for about 48 hours before I was referred to as a damn Yankee for the first time––and have taken it (and worse renditions of it) as a compliment ever since. But while it's fun to parse things up simply like that, I always somehow felt like it was deeply more complicated. For one thing, it always confused me how in the south, many people tend to claim ownership of rural culture––almost as if everything north of Virginia was just a big suburb of New York City where things like banjos and pickup trucks with balls didn't exist. Growing up at the northern tip of Appalachia though, I can tell you first hand that's not true, and I have neighbors here in Bradford County PA who are just as "redneck" as anyone I ever met in Rhea County TN (even if the general culture wasn't as pervasively oriented that way). So it always seemed to me that a lot of traits we tend to group into either northern or southern were really more "Appalachian mountain" or something like that. And then even among people who definitely are either northern or southern, it seemed like there were more significant differences. While my dorm mates from Georgia and Tennessee and I may have called each other names, I honestly could relate to them a lot more culturally than I generally can to people from south east Pennsylvania, certain parts of New Jersey or Long Island––even though they are all technically "northern," just like I am. But that's nothing compared to the divide between different varieties of "southerners," they practically have different languages. There are basically those who speak with a drawl, and those who speak with a twang, and based on which of those speech patterns they have, you can usually accurately guess a lot about them. This summer I traveled out west for the first time, and while checking a bunch of cities and national parks off my bucket list was the explicit agenda, I'd be lying if I didn't admit I hoped to get an idea of what "westerners" were like. Again though, it was more complicated. At first things were easy: Everyone from Nebraska to about three quarters of the way into Washington, Oregon and California seemed to fit snugly into one category––that is, outgoing, friendly and conservative with a paradoxical mix of individualism and desire to be neighborly. Then we got within 90 miles of the Pacific, and my beautiful little stereotype dissipated like so much pot smoke exhaled into the twilight air above Peugeot Sound. So, all that to say, for some time I've felt like the real cultural/political divides in this country were way more complicated than the easy north/south east coast/west coast barriers we tend to rely on in conversation. At the same time though, I feel strongly that they do exist. This evening I stumbled across this on NPR. It was created by journalist Colin Woodard based on voting records and opinion polls dating back 300 years. 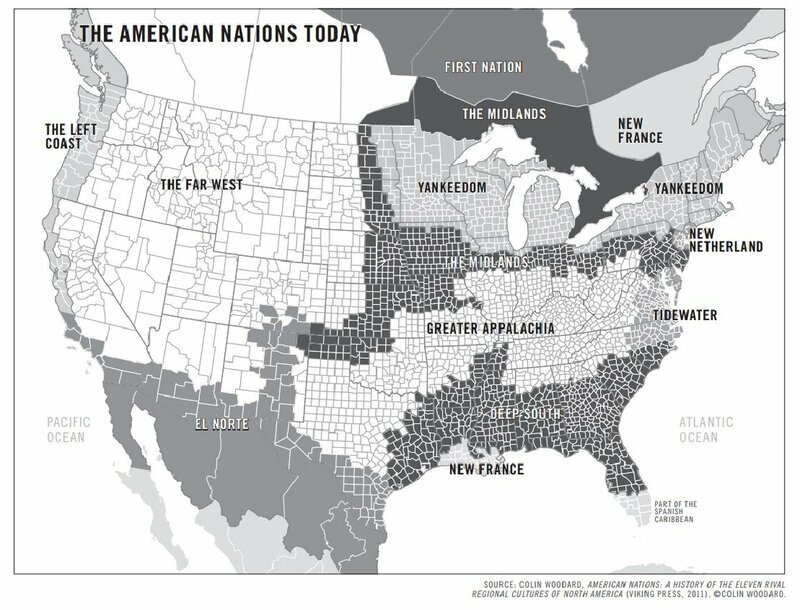 And according to him, North America is really divided up not into states, not into compass regions, not even into countries, but instead into 11 different nations. You can look at the map for yourself, but safe to say, it gave a tangible explanation for all of the weird suspicions I've had. Agree with it or not, it paints a very different picture of the divisions within this part of the world than tradition does. One thing remains unchanged though. I am still––by just one county line––a damn Yankee.